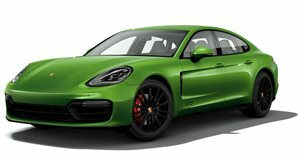 The German aftermarket specialists have unveiled a series of aerodynamic and performance upgrades for Porsche’s sporty sedan. The German tuning outfit recently developed an attractive aerodynamic package for the Porsche sedan. Up front, there&apos;s a JE Design front skirt (3,332 Euros) that further optimizes air in-flow of the intercooler. Daytime driving lights/market lights and blinking LEDs have been integrated into the elaborate double bars, whilea custom skirt has central vent openings where it meets the hood. Side skirts (1,547 Euros) complete with air inlets enhances the Panamera&apos;s sporty appearance. A fixed spoiler (1,547 Euros) replaces the extendable rear spoiler and a complete rear skirt (3,332 Euros) with diffuser and central air outlet can be fitted while using the standard exhaust system. However, a JE Design stainless-steel cat-back quad exhaust system with valve control can be fitted for 3,987 Euros. An electronically-adjusted, pneumatic air-suspension system (1,428 Euros) lowers the chassis by 20-30mm, and this new stance is enhanced by 22-inch &apos;Pandora&apos; light alloys with matt black spokes and stainless-steel surround wrapped in high-performance tires, priced at 6,545 Euros. An additional control unit bumps power of the 3.0-liter six-cylinder diesel from 246 to 296hp and maximum torque increases from 406 to 479lb-ft. As a result, 0-60mph is down from 6.8 to 6.5 seconds and top speed increases from 150 to 155mph. As for the Panamera Turbo, power of the eight-cylinder Bi-Turbo with its 4.8-liter cylinder engine has been boosted from 492 to 592hp and torque has increased from 516 to 627lb-ft as a result of modified control electronics. Its 0-60mph acceleration time duly decreases from 4.2 to 3.8 seconds, while the 188mph top speed remains unchanged. Software for the control unit for the diesel model is priced at 1,500 Euros and for the turbo the price is 2,000 Euros. Interested parties can head to the company website for further information or to place an order.